Your post caught my attention because I often wonder the same thing and how this could occur. It seems like something everyone should just know since it is so common but if you think about it there is an actual scientific process not many think to look into. 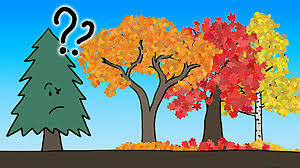 If it is that easy for leaves to change color due to lack of sunlight and low temperatures, is it the same process for them to grow back as green again? Does the temperature just have to go up along with increased sunlight? http://northernwoodlands.org/outside_story/article/how-do-trees-know-when-to-leaf-out-in-the-spring After looking up the process of how they grow back I came across this article explaining how in the north the trees don’t die, they are just dormant because it is too cold to produce any leaves and the buds made from the previous summer come out in the spring forming the leaves, and like you said the chlorophyll makes them green.